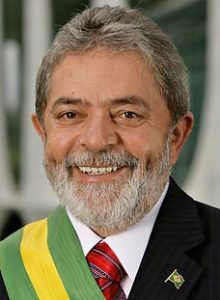 Photo: Luiz Inácio Lula da Silva, born 27 October 1945, known popularly as Lula, served as the 35th President of Brazil from 2003 to 2010. He was a founding member of the Workers’ Party. Brazilians are mixed Iberian-African-Indigenous peoples of Brazil. There are many different population samples, all with their own composition. There are nine data sets that have been incorporated into DNA Consultants’ method. 1) The Brazilian – Sao Paulo population data represent DNA samples from 93 Brazilian individuals from Sao Paulo. 2) The Brazilian– Sao Paulo population data represent DNA samples from 113 mixed ethnicity Brazilian individuals from the state of Sao Paulo. Samples were obtained by the Institute of Legal Medicine, Faculty of Medicine of Coimbra, in Portugal, and by the Institute of Legal Medicine of Santiago de Compostela, in Spain. 3) The Brazilian – White population data represent DNA samples from 100 unrelated individuals living in Brazil who were sampled in 2003 by universities in Brazil, Spain, and the US FBI. 4) The Brazilian – Santa Catarina population data represent DNA samples from 160 unrelated individuals in the southern Brazilian state of Santa Catarina. Santa Catarina is a state in southern Brazil with one of the highest standards of living in Latin America. Most of its inhabitants are descendants of Portuguese, German, and Italian immigrants, the cultural influences of which are apparent in the state’s architecture and customs. The Santa Catarina population is mainly Portuguese, and essentially from the Archipelago of the Azores — a group of nine volcanic islands in the middle of the Atlantic Ocean, about 900 miles west of the Republic of Portugal. Samples were obtained by National Institute of Legal Medicine, in Coimbra, Portugal. 5) The Brazilian population data represent DNA samples from 18,233 unrelated individuals from southeastern, southern, and central Brazil who constitute a representative sample of the characteristically mixed ethnicity presented in Brazil. These individuals were sampled in 2003 by the Genomic Engenharia molecular Ltda. In Sao Paulo, Brazil. 6) The Brazilian – Rio de Janeiro population data represent DNA samples from 230-300 unrelated individuals fro Rio de Janeiro State, Brazil who were sampled in 2003 by the Rio de Janeiro State University. 7) The Brazilian – Bahia population data represent DNA samples from 150 unrelated volunteers over 3 generations in Bahia who were sampled in 2004 by the University of Coimbra, Brazil and Portugal. 8) The Brazilian population data represent DNA samples from 397 Brazilian individuals from the mixed ethnicity found in the central, southeastern and southern regions of the nation, with a lesser amount of samples representing the north and northeastern regions. Samples were provided by Hereditas and PE Biosystems, both based in the capital city of Brasilia. Source publication: Populations Genetics of Nine STR Loci in Two Populations from Brazil, JFS, 2000, p432-435. Comparative analysis of STR data for Portuguese spoken countries, Progress in Forensic Genetics 8, 2000, p212-214. Brazilian Caucasian Population Data for 15 STR Loci (PowerPlex 16 Kit), JFS, 2004, p167-169. Allele Frequencies of 13 Loci in the Santa Catarina Population of Southern Brazil, JFS, 2003, p901-902. Allele frequencies data and statistical parameters for 16 STR loci -D19S433, D2S1338, CSF1PO, D16S539, D7S820, D21S11, D18S51, D13S317, D5S818, FGA, Penta E, TH01, vWA, D8S1179, TPOX, D3S1358 – in the Rio de Janeiro populations, Brazil, FSI, 2004 p131-132. Updated Brazilian genetic data, together with mutation rates, on 19 STR loci, including D10S1237, FSI, 2004, 139, p207-210. Population genetic data for the STR loci using the AmpFlSTR Identifiler Kit in Bahia, Brazil, Progress in Forensic Genetics 10, 2004, p219-222. Brazilian Population Database for the 13 STR Loci of the AmpFlSTR Profiler Plus and Cofiler Multiplex Kits, FSI, 2001, 118, 91-94. Statistical analyses of 14 short tandem repeat loci in Brazilian populations from Rio de Janeiro and Mato Grosso do Sul states for forensic and identity testing purposes, FSI, 2004, 139, p173-176.